Precise information about the life of Mirabai is hard to verify. However with the help of her poetry, and the writings of others; historians have pieced together the different elements of her life. it is generally agreed that she was born in 1498, the only daughter of a Rajput chieftain and landlord by the name of Ratan Singh, in the neighborhood of Merta, a fortress-city, founded by her grandfather Rao Dudaji, about 40-50 miles north-east of Ajmer. From an early age Mirabai felt an irresistible attraction and devotion to Lord Krishna. As a young child she was given a doll of Krishna. Child Mira began to love the idol of Krishna very much. She spent much of her time in bathing and dressing the image. She worshipped the image. She slept with the image. She danced about the image in ecstasy. She sang beautiful songs in front of the image. She used to talk to the idol. Mirabai was married to Prince Bhoj Raj. The Prince was the eldest son of a very influential Hindu family. The marriage gave Mirabai a very high social status. However Mirabai felt little if any attraction to the worldly comforts and pleasures of the Palace. Whenever she had the opportunity Mirabai would escape from her daily duties to spend time in prayer and meditation on her beloved Krishna. Her soul felt a spontaneous and overwhelming love for Lord Krishna. Her poems speak of the unbearable pangs of separation she felt when she could not contemplate and see her Krishna. Unfortunately her spiritual intensity and religious inclinations were not in any way liked by her husband's family. In fact they sought to actively stop her spending time praying to Krishna. They felt her only duty was to her husband and the good image of the family. Members of the family started to spread malicious gossip and create physical hardships; but no matter what they did, they could not undermine the unwavering devotion and love, Mirabai had for Lord Krishna. On the death of her husband things only seemed to get worse. The remaining family tried to get Mirabai to commit Sati. Sati is the practise of voluntary suicide, which at the time was quite common amongst Hindu widows. However Mirabai refused, saying she was betrothed to Krishna, and he alone was her real husband. After this incident, life got increasingly intolerable for Mirabai, so with the advice of various Sadhu's she left the palace to live as a wandering sannyasin on the streets of Vrindaban. (Vrindaban is a city associated with Sri Krishna's early life). Mirabai's Saintly reputation spread throughout northern India. Her devotional bhajans(songs) were infectious in their capacity to offer spiritual upliftment. Mirabai composed hundreds of poems in a simple, unpretentious style. They are full of intensity and transcendental spirituality. Through her poems / bhajans she expressed, with a powerful intensity, the spiritual fevour of an aspirant mad with the love of God. Mirabai is the most respected and loved poetess in the history of India. Many were inspired, by her example, to follow the devotional path of Vaishanvism. In the words of Swami Sivananda "It is extremely difficult to find a parallel to this wonderful personality-Mira-a saint, a philosopher, a poet and a sage. She was a versatile genius and a magnanimous soul. Her life has a singular charm, with extraordinary beauty and marvel." Sri Chinmoy says "Mirabai was a devotee of the high, higher, highest order. Among the saints of India, she is absolutely unparalleled. 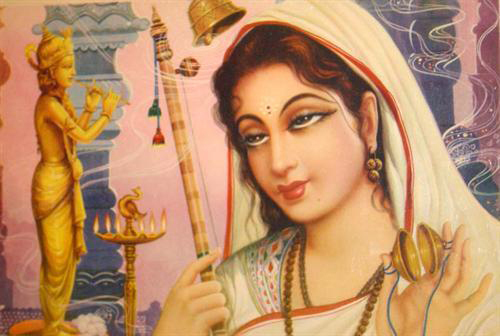 She composed many, many bhajans, which are prayerful songs to God. Each song Mirabai wrote expressed her inspiration, aspiration and sleepless self-giving." I remember how my mother would hold me. I would look up at her sometimes and see her weep. I understand now what was happening. But the Lord ordained thy fate. No merit is earned by virtuous deeds. Have I crossed to the further shore.